Bobb shares the bass, banjo and harmony duties in the Stillhouse Bottom Band. 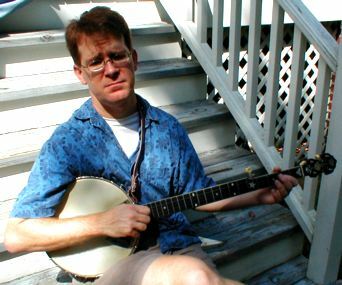 He also adds a little color with some mandolin picking, lends a hand on guitar from time to time, and sings a few of the band's songs. Shortly after the rest of the band started playing, they decided that having a bass full time would be a good thing, so the boys asked Bobb to check it out, and the rest is history. When he's not playing with the Stillhouse Bottom Band, Bobb finds time to play with Big Medicine and other groups, including Dueling Shoes, a percussive dance ensemble, and the Deep Phat Friars, a irreverant southern-fried contra band. He has also performed with a number of pickup bands. Before moving to North Carolina, he played with the Privy Tippers in Tucson and, before that, with the Self-Righteous Brothers in Houston.